Sometimes we PPC managers just need quick ideas for new keywords and bids. We don’t want to spend a lot of time doing keyword research and calculating keyword-level ROI. We just need to ramp things up in a hurry. Google has had an Opportunities Tab for a while now. It’s ok – not great, but ok. Not to be outdone, Bing Ads also added an Opportunities section – and they’ve done Google one better. Bing Opportunities are in both the online interface and the Desktop Editor. I’ve often wished that Google had an Opportunities section in Adwords Editor. Using Editor is so much faster than poking around in the online UI, so we’re there anyway – why not show us keyword & bid suggestions? But alas, it’s not there. Since Bing’s online UI is even slower and more painful than Google’s, I rarely log in except to check stats. For real PPC work, I’m in the Desktop tool. It’s great to have Bing Opportunities right there. Just this week, I was working on keyword expansions for a client. This client recently launched a new product line, so we’ve been actively adding new keywords for a while now. 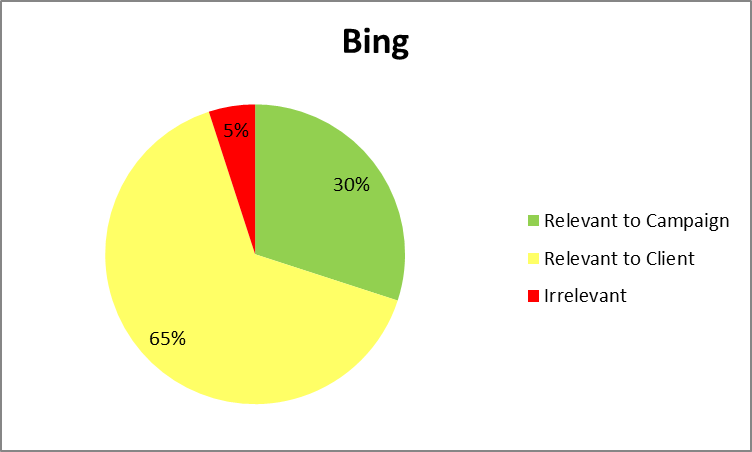 The client is in the B2B space, so we invest pretty heavily in Bing because their CPC is about 40% lower than Google’s. But that’s another post. I will say here that I loathe the red “error” bar in Desktop, mostly because it flags stuff that’s not even errors and/or that’s unfixable. But that’s another post. The optimizations were new keywords. Curious, I downloaded the list. It consisted of 100 keyword suggestions for the client’s new product line. The suggestions actually looked relevant and promising, unlike most of the recent Google Opportunities I’d looked at. So I began reviewing them in detail. Out of the 100 keywords, 30 were relevant to the campaign for which they were suggested. Not bad. Only 5 keywords were totally irrelevant to the client; the rest were applicable to other campaigns (just not the one they were suggested for). I don’t think I’ve ever gotten 30 relevant keywords from the Google Opportunities tab. On a good day I might get 3 or 4. So, I decided to hop on over there and see what they were suggesting for this client and campaign. 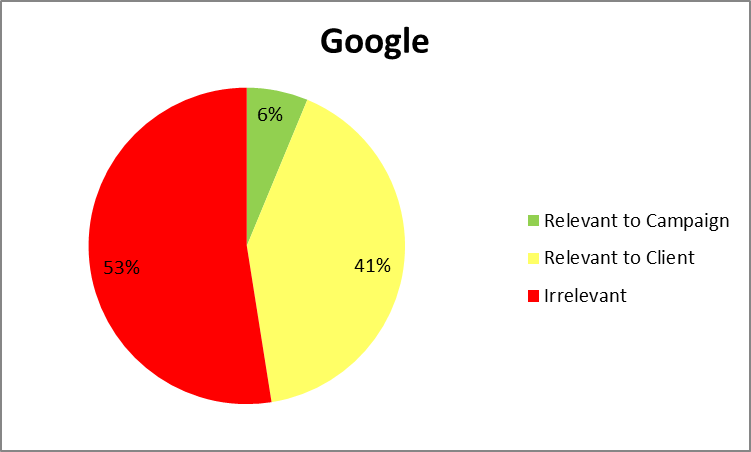 Google actually returned fewer total keywords: only 80 were suggested. But yikes, those keywords! Only 2 out of the 80 keywords were relevant to the campaign. Ouch. That’s not the worst of it. Out of the 80 keywords, 42 of them were irrelevant to the client. Let me say that again. More than half the keywords that Google said were “opportunities” were totally irrelevant! Worse than that, the majority of them were very broad, very high-volume consumer-focused keywords. The only opportunity here is the opportunity to line Google’s pocketbook. Here’s a visual showing the breakdown of the relevance of the keyword opportunities for the 2 engines. So whose Opportunities do you plan to take advantage of next time? Has this ever happened to you? You need to quickly increase or decrease PPC spend, and you’ve run out of ideas. You’ve tried everything you can think of, but there’s more work to be done, and you’re starting to panic. Choose the option that’s right for you. I’ve used all 3, and have gotten good suggestions for each option. But I’ve also gotten bad suggestions. Really bad suggestions. 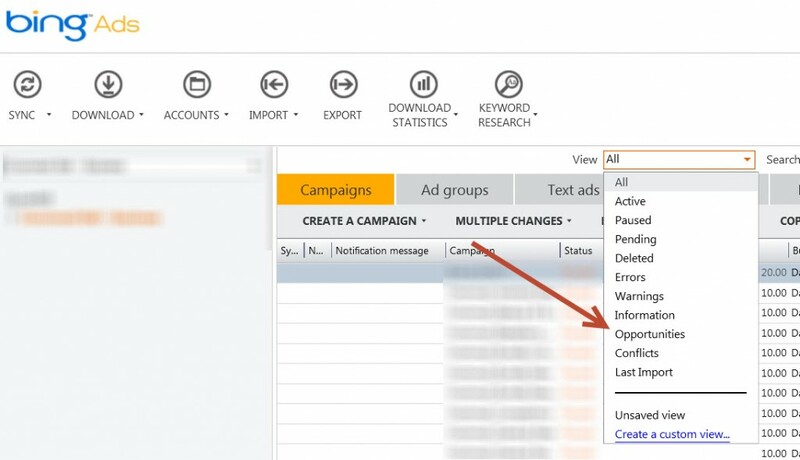 PPC Hero has a good writeup on why you shouldn’t blindly implement the Opportunities Tab suggestions – give it a read. If you do decide that the suggestions make sense, you have several options for implementation. You can add keywords or change bids right from the Opportunities tab – very handy if you’re comfortable with the suggestions. You can also download the recommended changes to Excel. This is helpful if you need to edit keyword ideas – if you need to add keyword-level URLs, for example, or edit match types. Finally, you can add the suggestions as an Experiment. I love this feature. Let’s say that the keyword recommendations are relevant, but you’re concerned you might get too much traffic and blow your budget. Or let’s say you’re not sure if the keywords will work for you. By adding the changes as an experiment, you can monitor results easily. If the changes perform, you can roll them out to all traffic; but if they don’t, you’ve reduced the risk. If you don’t like the recommendations in the Opportunities tab, you also have the option to remove them. Supposedly, Google will “remember” your choice and not show those suggestions again, although I’m not sure the process is flawless. I’ve seen some really bad suggestions that I’ve rejected, only to see similarly bad suggestions come up later on. Wordstream has a thorough post on the Opportunities tab, so check that out for additional information. What do you think about the Opportunities tab? Good, bad, or indifferent? Share in the comments!